On this Spurgeon Website Archive you will keep up to date with all new Spurgeon messages. In this archive you will find devotionals of Spurgeon in English. Read also the biography of CH Spurgeon and that of his wife Susannah Thompson. Collect remarkable information or watch the beautiful documentary film. Read his sermons, discover interesting facts or listen to an old sound recording of his son Thomas that dates back to 1891 . 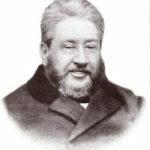 Look in the search field for a topic that concerns you because there is a wealth of information with rich content from Spurgeon in this archive.